RGV FC Toros' Pablo Aguilar (10) attempts a shot against Saint Louis FC during a United Soccer League game at H-E-B Park Friday, March 16, 2018, in Edinburg. 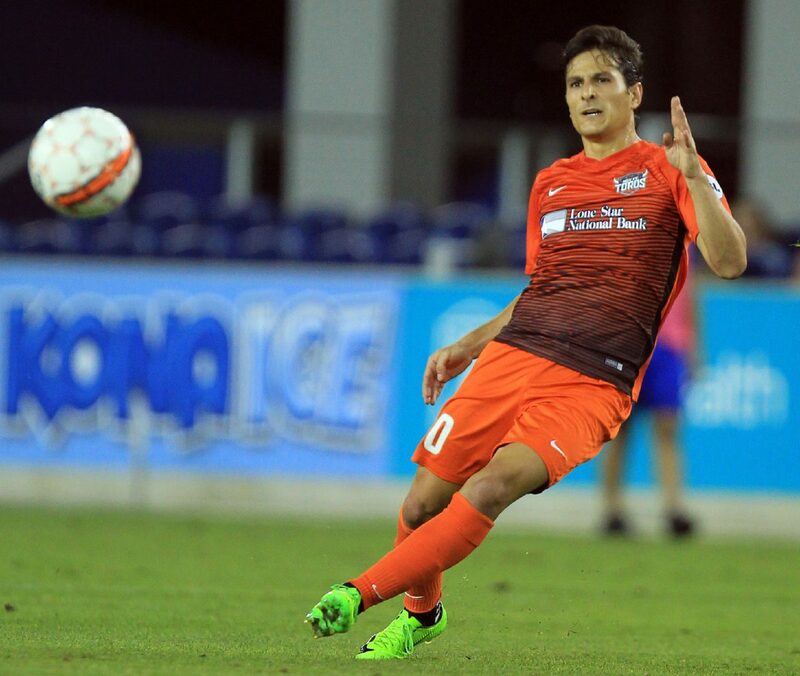 EDINBURG — When the University of Virginia faced UCLA for the men’s soccer national championship in 2014, current RGV FC Toros midfielders Pablo Aguilar and Todd Wharton were starting side by side. Wharton was a junior and Aguilar was a freshman as the Cavaliers won a shootout to claim the NCAA title. Also starting for UVA was Sheldon Sullivan, who has spent most of the season training with RGV FC after being drafted by the Houston Dynamo. In the waning minutes of regulation, Aguilar was subbed out for Eric Bird, who wasn’t starting because of a groin injury. Bird played with RGV FC the past two seasons before signing a first-team deal with Houston this year. The Virginia connection runs deep in the RGV FC organization, with Wharton and Aguilar expected to again start in the midfield as the Toros host Sacramento Republic FC at 7:30 tonight. Wharton and Aguilar also teamed up as midfield starters at UVA in 2015 — Wharton’s final college season. Off the field, Wharton said he spent most of his time with his teammates who were about his age. But between the lines, Wharton helped Aguilar find his place in Virginia’s system. With RGV FC, Wharton and Aguilar have become tighter in both regards. Wharton said Aguilar has grown greatly as a player since their time together at Virginia. Instead of always trying to take defenders on with his strong dribbling, Aguilar plays the ball more quickly to better involve his teammates and develop the attack. Wharton said he and Aguilar were in constant communication on the pitch during RGV FC’s season opening 1-1 draw against Saint Louis FC on March 16. Aguilar played a critical role in the opener, scoring the Toros’ lone goal. But RGV FC coach Gerson Echeverry said the score “masked some things that I think we need more from him.” After playing the No. 10 role during his time at Virginia and scoring 14 goals during his final two seasons, Aguilar is being asked to play No. 8 with RGV FC, meaning a little less offensive playmaking and a little more defending and distributing. Echeverry said Aguilar was too quick to play the ball sideways or backward during the opener rather than looking for ways to push play forward. Fatigue also became a factor down the stretch, as Aguilar played the full 90 minutes. Aguilar said RGV FC is “becoming his new home,” adding that he was always open to playing in the USL and was happy to simply be drafted at all. He said he’s enjoyed the process of transitioning to a new position and noted that his overall shift to professional soccer has been made easier by having Virginia teammates in close proximity. Aguilar said he’s especially close with Sullivan after the two played together for four years at UVA. Houston selected Sullivan seven picks after nabbing Aguilar.